A Plaid Cymru AM has apologised for making a reference to suicide in a Welsh Assembly debate. Helen Mary Jones had told a Conservative AM she would be happy to provide him "more rope to hang himself with". Ms Jones said the term, while "common parlance", was inappropriate. Labour AM Jack Sargeant, whose father was a former minister who was found dead days after he was sacked, said he felt "sick" after hearing the remark. The AM, who was elected to replace Carl Sargeant after his death, had complained to the presiding officer. He welcomed the apology. The comment was made while Tory AM Mark Isherwood attempted to intervene in a speech by Ms Jones. "All right," she said. "If he wants more rope to hang himself with, then I'm happy to provide him with it." 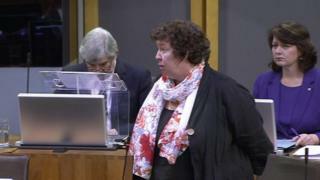 The AM for Alyn and Deeside had told the Presiding Officer Elin Jones he was "horrified and deeply sickened". His father was the late Labour AM Carl Sargeant, who was found dead at his home in 2017 days after he was sacked by the first minister. In the chamber on Tuesday Helen Mary Jones said: "In responding to a debate I made a reference, a commonly used phrase, for if a person is already in trouble perhaps they should desist. "But the term that I used was entirely inappropriate and made a reference to suicide." She added: "It should not have come into my head. I apologise profoundly to all those who were upset and distressed by it and I also apologise to this chamber for language which, while it may be common parlance, was inappropriate to use here." In response Mr Sargeant said: "It's completely right that the member has apologised for her language. "This particular issue isn't about me. Yes - I have been personally affected by suicide and I know the devastating impact it can make. But I'd be fighting on this issue if I wasn't here. "This is about the thousands of people in Wales and across the U.K. that are impacted by suicide." Responding to the apology, Mr Isherwood said: "I thank Helen Mary Jones for her words in the chamber today. It's not always easy to apologise. "I am of course, very conscious of Jack Sargeant's reasons for raising this, and I feel very much for him in these circumstances. "While robust debate and discussion is essential in a modern democracy, we must all be careful not to cross the line into areas which are insensitive at best, and risk causing harm at worst." You can also contact the Community Advice and Listening Line for Wales, which offers free confidential support with help to find local mental health services, on 0800 132 737 or text 'Help' to 81066.